I am a fashion designer and a freelance stylist, and I am trying to dabble in a bit of fashion journalism here in India. No one in particular, but I admire many. More like permutation and combination of limited items, and I try to wear them in a different way every time. I don't think much about what to wear..and that is why the result is a grunge-ethno-preppy mish mash. My schedule for the day..generally a big bag with spare shoes and some make-up, just in case there's an unplanned change. Madeline Vionnet, Nicholas Ghesquire, Issey Miyake, Martin Margiela, Dries Van Noten, Anamika Khanna. A black dress by Ghost- it is a miracle versatile dress that was made for me- I believe. I never break this fashion rule. Wear it with a sense of humor. I think I've worn them all...disaster or not. The plain-Jane grey/ black top that goes with everything, and can be teamed up in every possible way. The mirror, mostly. And my boss..sometimes. It helps. No point when you are walking about in India. Flea markets and vintage stores. Orange Lipstick, and Yellow eyeshadow. I only buy __________ in Europe. Lots of jackets..when I lived there. Everyday office-wear. No point, in this weather. And dust. Quality inner wear. Very fussy. Right now- tapered dark Indigo jeans..not very tight and with a front pleat. Casual, semi formal, dressy. Dior Addict, Body Shop Tea Tree Range. I have only been to London among the ones mentioned...and yes, people there have very good aesthetics mostly. I like the result of the multicultural mix in the sensibilities, and the fact that the city has something for anyone-from anywhere. My own creation- a disaster haircut, and mighty smug about it. Spot and Street, Tank, ID..and I only saw a couple of issues of 'Rubbish'. Anywhere, as long as I am with my friends. If on my own, then London. Leopold's and Mondegar in Mumbai for relaxed unpretentious let-your-hair-down ambience. Comments on "Style Profile...Sohiny Das, New Delhi"
Is this the same woman who wore the black dress with the yellow flats in india, who you said was like Audrey Hepburn? Either way, I think she is very beautiful and I love her menswear look with the silver eye makeup. Love her eye liner in the top photo - looks great! She is gorgeous and the silver eyeliner is genius on her complexion. Her style almost seems rebellious. I undestand her very well cause i´m from a third world contry, too. Fashion is harder in there. She looks so fresh, it seems like she has a certain rawness to her. Very beautiful. I love this style profile, articulate and funny. I wish she were my best friend. She's wonderful, unpretentious and open. She sounds super lovely, and looks it as well. I love the colours of the pellets on her shirt but the trousers let the entire outfit down, they look a little too much like jammies. I would love to see some of her designs. Gorgeous, fascinating girl. She seems to teeter between sophistication and nonchalance impeccably. i loved when you posted her looks before. i am even more excited to learn more about her. I want to be friends with her. i want to be her friend too! Love that she splurges on quality inner wear...I know that we all should do that---everything would look and feel better (just check out how the outer things look on her)---though it is hard to do. Seems a bit self-indulgent to splurge on the inner things--but, if it actually enhances the look and boosts one's confidence, why not? And, a she's a fellow rower! I love that, too. Very nice profile. Interesting! I like positive news of life! I just love her modesty and sincerity. I think this is the best/most interesting style profile you've done so far. Sohiny, I hope you keep the Sartorialist up to date with your doings and he lets us know. We've all sort of fallen in love with you here! Plus, a girl who proudly sported her own creation disaster haircut is a girl after my own heart. Over here in my dusty place, I'll take your fashion approach as inspiration. I disagree about her trousers. I think they just add to her personal style.. I love fashion but as a sport enthusiast/runner sometimes it's hard to find fashionable 'comfy' clothes. I believe that her being a rower really explains the trousers. my question is: does anyone know where I could get a similar pair? She seems to have a good sense of humour about her style. definitely my favorite profile so far...i love her free spirited and fun personality! She seems to be a very strong person, and she has something different in her eyes. I use too Dior Addict! 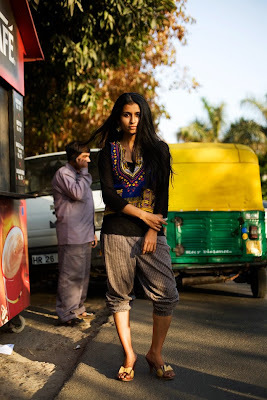 those trousers are from a pavement market in Calcutta. They're actually houndstooth stretch pyjamas..i have just worn them scrunched up.. I'm guessing you'd get similar stuff anywhere..
She's my favourite too! I think she seems really sweet & unpretentious - and I love her silver eyes in the first picture. Love that you did a profile on Sohiny! I was really taken by her when you photographed her earlier in the year. She seems like such a great, fun person...doesn't take 'fashion' too seriously and isn't afraid to experiment and make mistakes. Definately would love to be friends with her too! it'd be brilliant to see some of her designs...maybe that could be another post? Please do a "Style Profile" on Lino Ieluzzi. It would be so nice! Thank you! This is the most interesting profile I've seen here by far. I think it's really great you're giving us notes from the beaten paths as well as the "regular" cities. Love these different types of style profiles! It's fun to hear where different menswear designers buy their suits and shoes but it's also nice to shake things up with women, and unconventionally-dressed women at that! Another brilliant addition. I especially like her reminder that fashion should have a sense of humour. Wowie! She is so stylish! Words and all.. I die over those pants. I often go back to India and stock up on slouchy trousers, pajamas, harem pants. Comfort chic! That shirt in the second photo--wow! the 'no guilt in pleasures' quote is one to remember. Love that first pic of her. The eye makeup is fab. I love these profiles. Would you consider doing one with the lady you've photographed (in Paris, I think) in overalls, and in a great black coat? And, one with The Twins from May 14? Love the light and the colors in the bottom photo. The sunlight hitting her calf: it's very sensual. Sohiny simmers with mystery, self-confidence and sexiness. Interview was refreshing, special. Gorgeous top & stylish, comfy pants. Wasn't sure they worked together at first, but after reading feel it reflects her perfectly. She knows how to express herself in fashion. Thank you for these profiles. They are so interesting, I see them collected in a volume. besides "No guilt in pleasures" I also liked "Wear it with a sense of humor" as well as the use of disaster... twice! once as a noun and even better the second time as an adjective... "disaster haircut" sounds like the name of my new favorite band. I like very much this young woman. A lack of pretension and effortless style that is refreshing. This is your best style profile. It's great to see someone who dresses so well without pretension. she seems natural and real, plus all the designers she mention i never heard of. she makes it look effortless, yet classy. You should check out Croatia. The locals have a very distinct/hip yet not too flashy style. I loved the subtle colors and combinations of the outfits. Awesome! I am obsessed with orange lipstick too. May I suggest Fluorescent orange #201 by Make Up Forever. Would look so good with your complexion. I think style is being able to rework the same pieces into completely different outfits. Props! awesome profile and seems like a sweet girl. I was once in Leopold's in mumbai. I felt I was sitting with modern people but in a good old 1950-60s restaurant. I love the look of the restaurant. Will be added soon on my blog. She looks great. May I invite her to dinner? Nice profile... Girl is too cool!!! can't believe this is u shona...gorgeous and so very smart. proud of u irl!